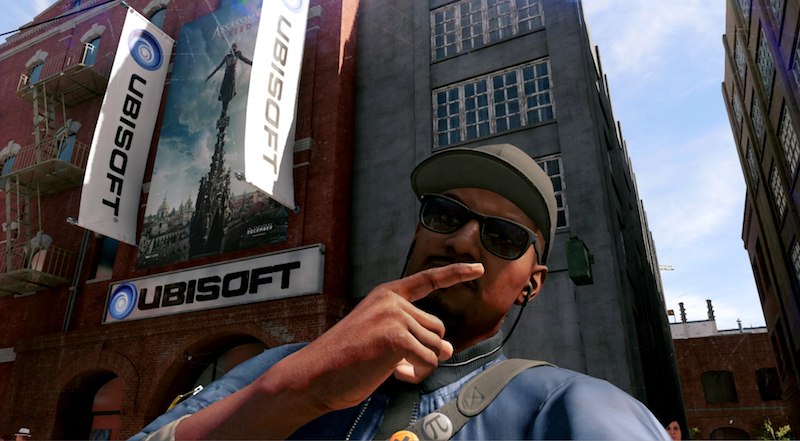 Watch Dogs 2 takes place in a fictionalized version of San Francisco that occasionally cuts pretty close to the real world. For example, there’s a Ubisoft marketing director in the game who is not happy about Assassin’s Creed games being leaked to the press. “I can assure you, there’s no way the trailer’s getting out,” says Mr. Chen to his boss. He assures her their security has never been tighter, and promises that if the game leaks, they can fire him. His boss tells him the thought’s already crossed her mind. Kotaku readers will likely get the reference—after all, it’s become an annual tradition for Assassin’s Creed games to leak through the information and assets that people send our way. Ubisoft even blacklisted Kotaku as a result of these leaks, though they’ve been working with us again recently, which is why I’m writing about Watch Dogs 2 right now, the day before it comes out. The trailer, which starts at 2:16, cuts out partway through. The game looks like some sort of space-western, or maybe space trucking? Sounds good to me. That trailer actually found its way onto the internet over the weekend, and has some people speculating that it might be a tease for a real game. It’s all extremely, enjoyably meta. It also isn’t the first time a Ubisoft game has blurred lines with the real world. Assassin’s Creed IV’s modern-day segments took place within a games studio that bore a more than passing resemblance to Ubisoft Montreal and let you sneakily read some email conversations that might as well have been about the actual future of the series. As for Watch Dogs 2 itself, the review embargo is up but I still have a lot left to play. General impressions: It’s a fun video game and a big improvement over its predecessor. I’ll have a full review later this week. For now: Well played, Ubi.